It's difficult to focus when there's background noise everywhere you go. From the hum of an AC to the rumble of an airplane engine. It's all very distracting. To help block out ambient noise, Plantronics now features optimized active noise cancelling technology, known as ANC. To understand how it works, imagine sound waves oscillating through the air. The headset detects these waves, then emits new inverted sound waves that cancel out distracting noise. With disruptive low-frequency noises removed, ANC makes phone calls and music sound clearer. Now you can focus on what matters most, not on the noise around you. Active noise cancellation, brought to you by Plantronics. 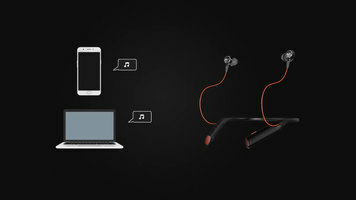 To enhance your audio experience, Plantronics now implements active noise cancelling (ANC) technology, which brings you awesome improvements in the clarity of music and phone calls. Check out the video to see how it works! 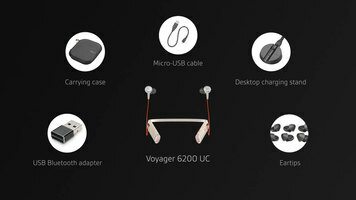 Watch this video to see how to work your Plantronics Voyager headset! With Bluetooth capabilities and easy controls on the ear cups, you will have it up and working in no time! Using the Plantronics headset is simple and convenient - see how simple it is to get started! With just a few simple controls on your headset, you can control your music, voice calls, and volume with ease while on the go. Check out all the benefits a Plantronic's headset can bring you in your busy office setting! 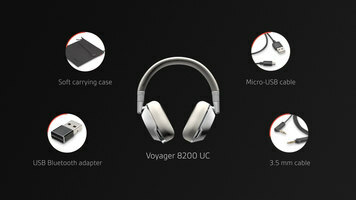 It delivers excellent audio with noise cancelling capabilities, and also uses multiple microphones so you can clearly speak to someone over the headset.